The Uniquely Abled Dance Center, Inc., is a center designed to teach the disabled how to dance. Those included in our program are the blind and visually impaired, deaf and hearing impaired, children and adults with Down's Syndrome, those confined to wheelchairs, and developmentally delayed. All classes are custom designed to the abilities of each group. All forms of dance including jazz, ballroom, tap, and classic ballet are taught. Classes at the Uniquely Abled Dance Center are free of charge to all participants. Nancy wishes to establish a reputation for the Center as a caring community organization rather than a profit-oriented endeavor. 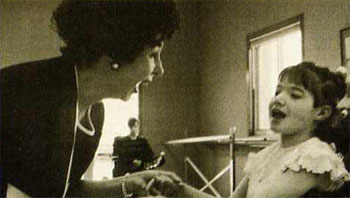 The establishment of the Uniquely Abled Dance Center has been made possible through the donation of time and money by many individuals and organizations. Additional funding is necessary each year to keep the Uniquely Abled Dance Center in operation. The Uniquely Abled Dance Center is a non-profit organization (501 c3), which means all donations are tax deductible. All donations are used for the operation costs of the Center; No money is spent on salaries or advertising. Dance is a tool used to enhance the broader scope of human development. Through the Uniquely Abled Dance Center program, disabled participants greatly enhance their self-esteem and self-reliance. The Center provides an opportunity for diverse individuals to meet as equals and share their thoughts.